Dec 4, 2013 – U.S. Forest Service fire managers say the Table Rock wildfire in the Linville Gorge is 100 percent contained. Recent precipitation helped suppress the wildfire. The gorge and its trails are open to the public. Visitors should use caution when in the gorge as there may be hazard trees or other conditions that pose safety risks. Forest Service personnel will soon begin any rehabilitation efforts needed in the area. Law enforcement officials continue to seek a person of interest who may have information related to the cause of the fire. The cause of the fire is still under investigation. 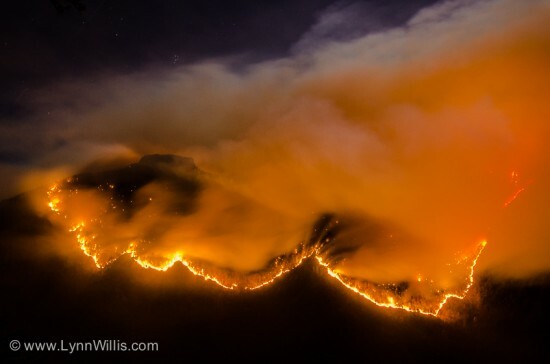 The wildfire, which started on Nov. 12, burned 2,579 acres. The gorge is part of the Grandfather Ranger District in the Pisgah National Forest. 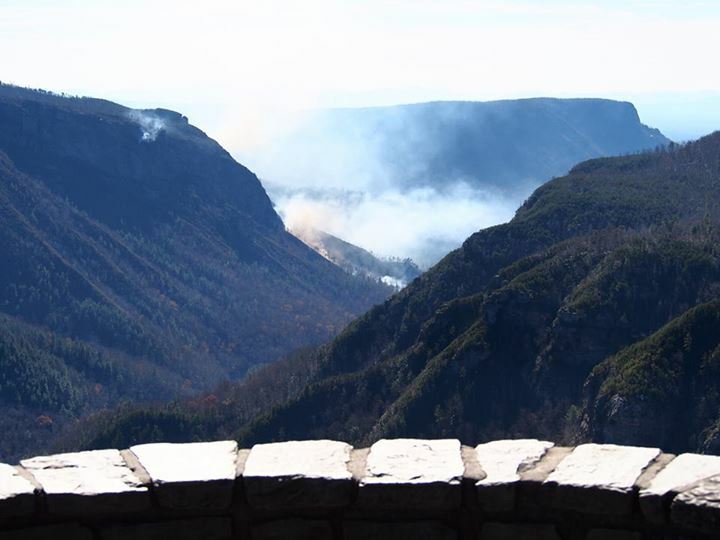 Monday November 25 – Operational Control of the Table Rock Fire Returns to the Grandfather Ranger District; All Road and Trail Closures in the Linville Gorge Area Lifted. Due to successful firefighting efforts and wet weather, the Table Rock Fire is approaching full containment. Tomorrow morning, Tuesday, November 26, 2013, command of the fire will transfer from the Southern Area Type 2 Team back to the Grandfather Ranger District of the Pisgah National Forest. All US Forest Service roads and trails under the Forest Closure Order are now open, including Table Rock Picnic Area. Today is opening day of rifle deer season. The weather forecast predicts below freezing temperatures. 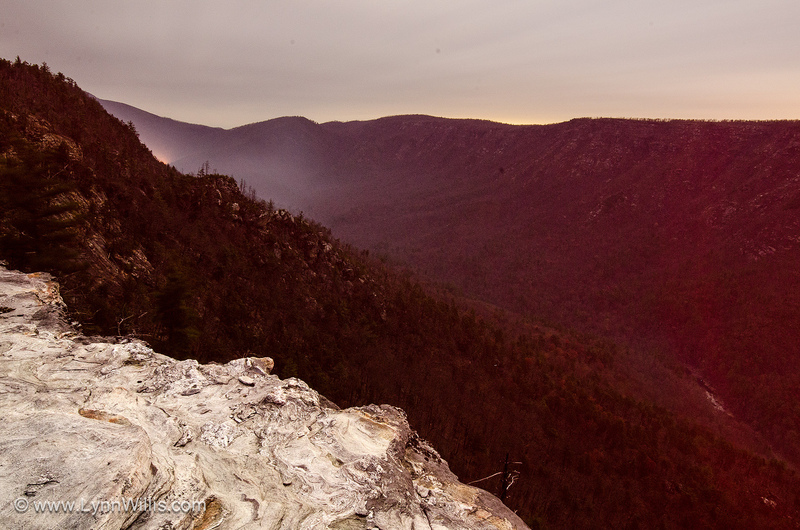 Hunters and others using the Linville Gorge area are reminded to use standard safety measures with campfires. Make sure campfires are “dead out” before leaving them. On Sunday, November 24 the Table Rock Fire continued to show very low fire or smoke activity. However, reduced humidity, stronger winds, and sunshine resulted in isolated fire activity in some areas of Chimney Creek. Due to the inaccessibility of the area, a helicopter was used to extinguish the hot spots with water drops. Until significant rain arrives, expect that other hotspots could flare up. Efforts will continue on the rehabilitation of the fire line. Table Rock Fire will be monitored during the day for new fire activity. Monday winds will decrease to 4-7mph gusting to 12mph. Wind direction will shift coming from the south southeast. Relative humidity will be 20 to 30%. Temperatures will be around 18 degrees F in the morning. Rain and freezing rain are expected Monday night into early Tuesday. Fire traffic will continue to be seen on roads. Crews are still actively commuting between the base camp at Catawba Meadows Park and the fire line. Drive with caution. 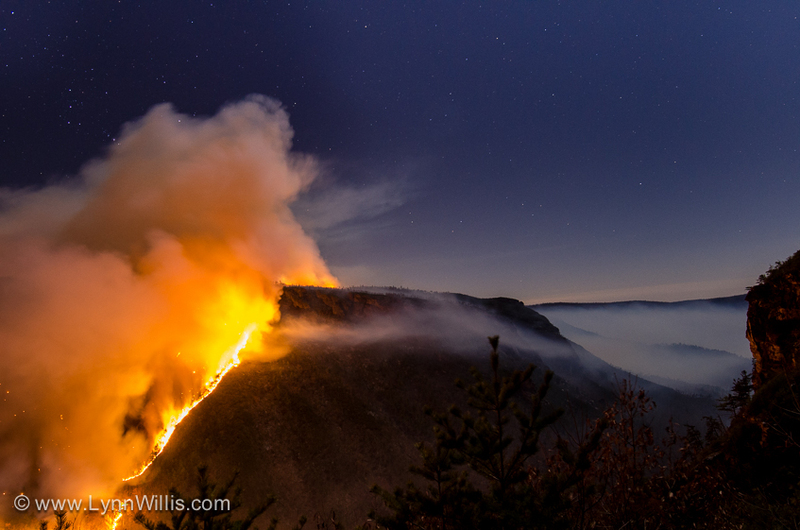 The Table Rock wildfire which started November 12th is located in Linville Gorge on the Grandfather Ranger District of the Pisgah National Forest. The November 12, 2013 Forest Closure Order for sections of the Linville Gorge will be lifted at midnight on Sunday night, November 24, 2013. The gorge was closed to the public due to the Table Rock wildfire. Rifle deer season begins Monday morning; the gorge will be open for hunter access. 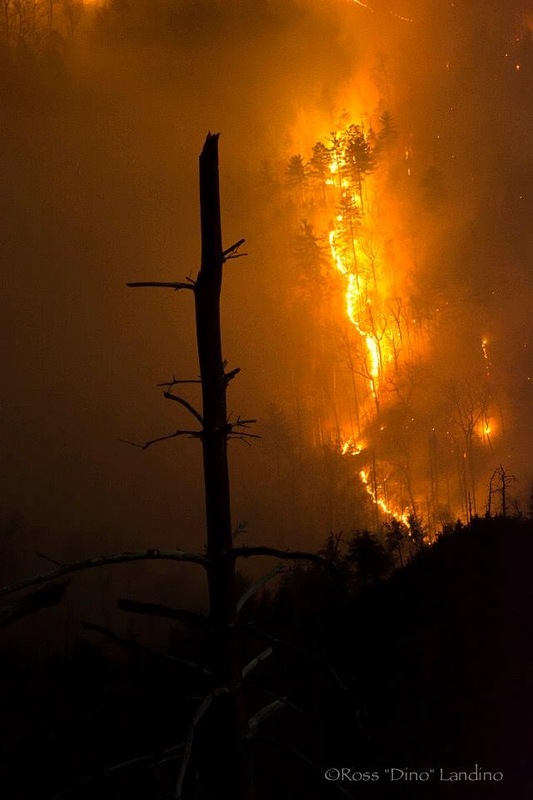 The National Forests in North Carolina made the announcement today as firefighters wrap up work on the Table Rock wildfire. The Forest encourages hunters to remember that conditions have changed in this area as a result of the wildfire. “There are many hazards out there that may not be immediately evident,” stated District Ranger Nick Larson. Some of those hazards include burned out stump holes, fire weakened trees and snags, and areas of smoldering fuels or active fire. Changing weather conditions like wind and ice, can increase the safety risk to hunters by causing trees and snags to fall or unburned areas to ignite. Ranger Larson also reminds hunters to get to know the areas they are hunting and be prepared for these new hazards. In the unlikely event that hunters encounter smoldering fuels or active flames, they should leave the area and find another location to hunt. Recreationists to the gorge should be aware of hunters in the area for the next few weeks. Likewise, hunters are advised to be on the lookout for other recreationists using the area. It is a good safety practice for all visitors who venture into the forest to wear bright orange during hunting season. Don’t forget to include something orange on your pets. For more information on safety tips for hunters and non-hunters when visiting the National Forest, visit the website http://www.fs.usda.gov/detail/nfsnc/home/?cid=STELPRDB5416422. Suppression efforts continued on Saturday November 23. As a result of previous operations and weather, low fire or smoke activity was present. Mop-up and rehabilitation work have been completed at the Outward Bound Center and the Table Rock Picnic area. The area remains closed to the public. Efforts will continue on the rehabilitation of the other sections of the fire line. Over the next week the Table Rock Fire area will be experiencing changing weather conditions. Today will have winds from the NW from 12-16 mph decreasing to 8-12 mph. Firefighters will need to be especially vigilant for hazard trees due to the increased wind. Relative humidity will be deceasing throughout the day in the 19-24% range. With these weather conditions fire danger will be high. The colder temperatures in combination with the strong winds will produce wind chill values as low as 0 degrees F this morning. Rain and freezing rain are expected Tuesday. Rain is predicted through Wednesday. The Temporary Flight Restriction over the Table Rock Fire has been lifted this morning. With the opening of rifle deer season on Monday November 25th, hunters are reminded to check the National Forests in North Carolina web page (above) for current closure information. 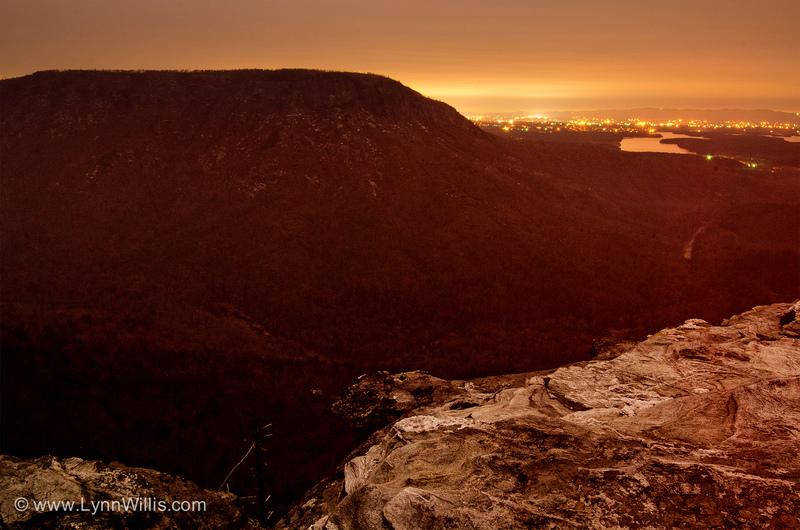 Be sure to check the web site before making plans to enter the Linville Gorge area. Currently, this area remains closed. Cold weather and hunting season often means campfires. Be sure to use standard safety measures with fire. Make sure camp fires are “dead out” before leaving them. Traffic alerts continue. Firefighters continue to move to and from the fire, and there is a chance of low visibility due to smoke. Current weather conditions add another level of risk for drivers in the area. Drivers are encouraged to remain alert and drive slowly. Patrols of the fire perimeter found very low fire or smoke activity. As a result firefighters will continue mop-up and rehabilitation efforts today, in advance of changing weather conditions. With an expected increase in wind speed, fire crews will be scouting for and removing hazard trees. To reduce the chance of erosion, firefighters will continue rehabilitation by building water bars along dozer lines. Hand crews will be doing similar work in the Linville Gorge Wilderness and areas inaccessible to dozers. Fire lines will be reseeded to reduce the chance for erosion. The Table Rock Fire area will be experiencing changing weather conditions over the next week. A strong cold front moved through the area this morning. Winds this morning will be out of the Northwest at 6-9 mph with gusts to 12 mph. This afternoon the Northwest winds will increase to 9-13 mph, with gusts between 20-25 mph developing late in the day. Tonight, sharply colder temperatures will move into the region on strong Northwest winds of 14-18 mph with gusts to 30 mph. The colder temperatures in combination with the strong winds will produce wind chill values as cold as 0 degrees F by Sunday morning. Rain is expected Tuesday through Wednesday, with 1 to 2inches possible. The opening of rifle deer season is Monday November 25th. Hunters are reminded to check the National Forests in North Carolina web page for (above) for current closure information. Notifications are posted in a timely manner; be sure to make a final check on the site before you plan to enter the Linville Gorge area. Cold weather and hunting season often means campfires. Be sure to use standard safety measures with fire. Make sure camp fires are “dead out” before leaving them. People driving through the area should continue to be alert for fire traffic and low visibility. Even with low fire activity crews are still actively commuting between the base camp at Catawba Meadows Park and the fire line. Firefighters began rehabilitation efforts today on sections of the fire that are considered controlled. This includes reseeding and using bulldozers outside the wilderness area to build water bars to reduce the chance of erosion. Hand crews will also be doing similar work in areas inaccessible to dozers. The success of the small burnout operation on November 20 in removing most of the fuels from the 100-acre block has reduced the opportunity for the fire to spread to the south and west sides of Linville Gorge. Firefighters will continue to monitor the fire for hotspots. Using water and hand tools firefighters will extinguish any hotspot near the fire line. Due to favorable weather conditions the Table Rock Fire is expected to have little activity today. The prediction of light winds and much higher humidity for the next day will limit the potential for the fire growth. A strong cold front will move through Saturday morning with sharply colder temperatures, very windy conditions, and much lower humidity levels through Sunday. Report on the Community Meeting. A community meeting was held at the Jonas Ridge Volunteer Fire and Rescue Department last night November 21, at 06:00pm. The meeting was organized by the Grandfather Ranger District with the assistance of the Southern Area Type 2 Team to provide information about how decisions are made relating to fire suppression and to allow the public to ask questions about the firefighting operation on the Table Rock Fire. Approximately 55 people attended the community meeting. The Southern Area Type 2 Team appreciates patience of the local community during this incident. People driving through the area should be alert for fire traffic. To date, the team has had an excellent safety record. Even with low fire activity, crews are still actively commuting between the base camp at Catawba Meadows Park and the fire line. With continued chance of fog development and smoke, there is always the risk of reduced visibility. Monday is opening day for rifle deer season. Hunters are reminded to check the web page for National Forests in North Carolina (above) for current closure information. 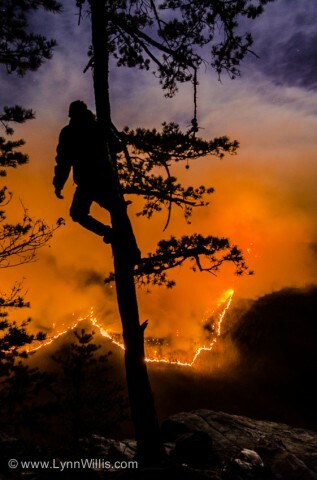 The Table Rock wildfire, which started November 12th, is located in Linville Gorge on Grandfather Ranger District of Pisgah National Forest. Photos: Lynn Willis/www.LynnWillis.com. 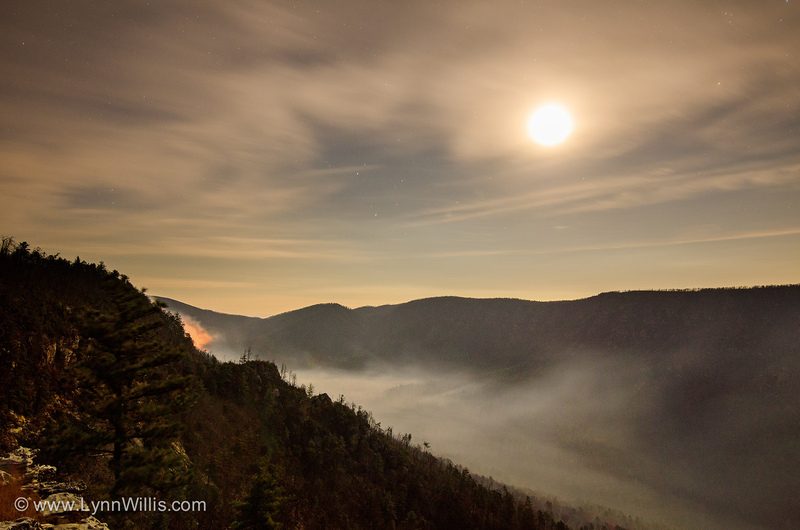 Lynn notes “I spent Wednesday night (Nov. 20) and Thursday morning on the rim of the gorge and captured the last remaining hot spot of the fire and lingering smoke in the gorge. Nov 21, 2013 – U.S. Forest Service law enforcement officials have released a photo of a man who may have information concerning the wildfire in the Linville Gorge. The agency asks for the public's help in identifying the individual. 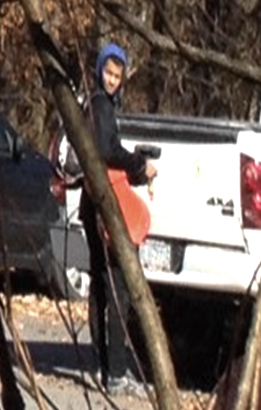 Investigators would like to speak with this person who was in the Table Rock picnic area on Veterans Day. It is believed that he camped in the Table Rock picnic area over Veterans Day and may have information that would aid the investigation. This person was with a group of other campers and may play the guitar. There was a truck in the area believed to be a white, 2007-2009 Dodge Ram truck, possibly a sport model. Persons with information concerning the person, group of people, or vehicle at the Table Rock picnic area on Veterans Day are asked to call Law Enforcement Officer Jason Crisp at 828-442-2470. The cause of the fire is still under investigation. Fire investigators are looking for any information or observations that may help determine the cause of the fire. A reward may be offered for substantial information. 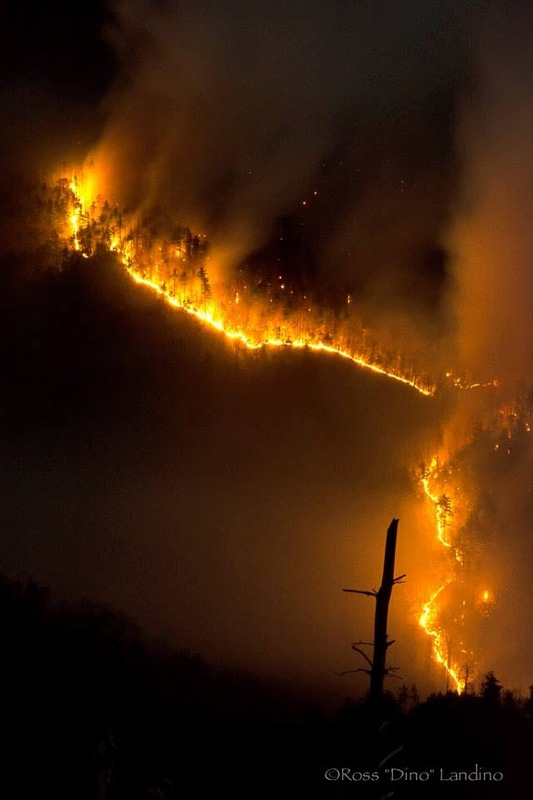 The Table Rock wildfire has burned approximately 2,600 acres in the Linville Gorge in the Grandfather Ranger District, Pisgah National Forest. The Table Rock Fire is expected to have little activity today due to increased humidity, light winds, and sparse fuels in the areas where there is active fire. Yesterday’s small burnout operation was successful in removing most of the fuels from the 100-acre block between the active fire, Chimney Branch to the south, and Linville River to the west. Observations from the helicopter indicate that the Chimney Branch drainage is holding fire progression to the south. Today, firefighters will actively monitor that area to make certain the fire does not spot over into unburned fuels south of Chimney Branch. Forecast winds for the next several days will keep any embers from this burnout within the black area of the fire. Light winds and much higher humidity levels forecast for the next couple of days will limit fire growth potential. Despite more favorable conditions to limit fire growth, the combination of fog development and light winds may lead to highly reduced visibilities near the fire tonight through Friday morning. Persons driving through the area during those times should be alert for rapidly changing conditions and use extreme caution, slow down, and turn on headlights. A strong cold front will move through Saturday morning with sharply colder temperatures, very windy conditions, and much lower humidity levels through Sunday. A Community Meeting is planned for this evening to inform neighboring communities about the processes and strategies used to identify and select fire suppression activities. There are many variables that must be considered before critical decisions are made in firefighting. The public is invited to join local US Forest Service officials and leaders from the Southern Area Type 2 Team for an opportunity to learn about the fire, what has happened to date, what actions are being considered, and what factors will affect decisions relating to those actions. 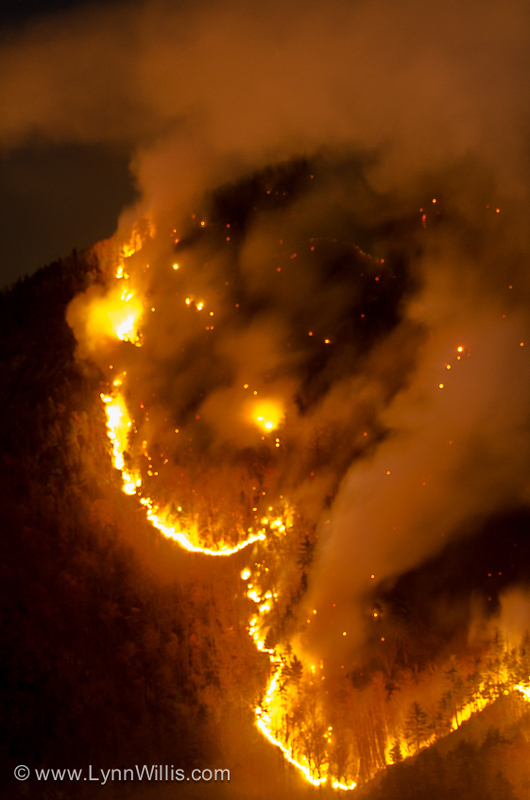 The Table Rock wildfire, which started November 12th, is located in Linville Gorge on the Grandfather Ranger District of the Pisgah National Forest. The Table Rock Fire showed some increased activity this morning in the area just north of Chimney Branch. A decision was made to burn the 100-acre block of unburned fuels between the active fire, Chimney Branch to the south, and Linville River to the west to strengthen the natural barriers and aid in slowing the fire’s southern progress. Today, weather conditions were optimal for completing the burnout in a safe manner. Ignition was accomplished using plastic spheres resembling ping-pong balls containing combustible chemicals. After being activated, the spheres were dropped from a helicopter-mounted aerial ignition machine into the specific areas targeted for burning. Forecast winds for the next several days will keep any embers from this burnout within the black area of the fire. Weatherwise, light winds and much higher humidity levels will limit fire growth potential over the next couple of days. Despite more favorable conditions to limit fire growth, the combination of fog development and light winds may lead to highly reduced visibilities near the fire Thursday night and Friday morning. Persons driving through the area during those times should be alert for rapidly changing conditions and use extreme caution, slow down, and turn on headlights. A strong cold front will move through Saturday morning with sharply colder temperatures, very windy conditions, and much lower humidity levels through Sunday. A Community Meeting is planned for tomorrow evening to inform neighboring communities about the processes and strategies used to identify and select fire suppression activities. There are many, many variables that must be considered before critical decisions are made in firefighting. The public is invited to join local US Forest Service officials and leaders from the Southern Area Type 2 Team for an opportunity to learn about the fire, what has happened to date, what actions are being considered, and what factors will affect decisions relating to those actions. For more information, contact the Fire Information Center at 828-432-9817. For information on the latest road and trail closures, visit the National Forests in North Carolina website. Visitors should check the website before planning a trip to the gorge. Additional information and photos can also be found at the Incident Information System website http://inciweb.nwcg.gov/incident/3752/. The cause of the fire is still under investigation. Fire investigators are looking for any information or observations that may help determine the cause of the fire. A reward may be offered for substantial information and persons should contact Law Enforcement Officer Jason Crisp at 828-442-2470 or the Grandfather Ranger District at 828-652-2144. This morning at 6:00 am, the Southern Area Type 2 Team assumed management responsibility for the Table Rock Fire. At morning briefing, Incident Commander Steve Parrish commended the work of the departing North Carolina Type 3 Team and reminded firefighters that we will continue to plan suppression strategies with firefighter and public safety as highest consideration. Today’s plans are to actively monitor the fire’s expected continued slow progression, fortify containment lines, and mop up areas where the fire is no longer actively burning. However, fire suppression strategies are always flexible and must be adjusted as conditions change. Should the fire become more active due to weather, fuels, or other conditions changing, suppression activities would be adjusted accordingly. Due to the inaccessibility of the active fire area, currently mapped containment lines are located approximately two miles south of the fire. One of those options, should the fire begin a rapid progression to the south, would be to burn out sections of the area between the active fire and the containment lines. Implementation of this option would require very specific conditions including wind direction, wind speed, smoke dispersion forecasts, temperature, and humidity. Those conditions are predicted to occur today, however, burnout operations are not planned for today unless the fire makes a major run to the south. With today’s predicted weather, no significant change in fire behavior is expected. The Table Rock wildfire, which started November 12th, is located in Linville Gorge on Grandfather Ranger District of Pisgah National Forest. The fire is currently at 2,481 acres and 40 percent containment. There are 200 firefighters working on the fire. Management of the Table Rock fire has transferred from the North Carolina Type 3 Team to the Southern Area Type 2 Team effective tomorrow morning. The Type 2 Team will continue to operate under the same incident objectives, which is to provide for firefighter and public safety, provide for protection of surrounding communities adjacent to the fire, minimize environmental concerns related to operations, and manage the incident in the most efficient and cost effective manner commensurate with values at risk. The change in Incident Management Team will be seamless for the public and firefighters, as they will continue to focus on suppression efforts and monitor the fire’s slow progression. Based on predicted weather patterns for the next week, the Team will actively monitor the fire, fortify containment lines, and evaluate longer term options. One of those options, should the fire begin a rapid progression to the south, would be to burn out sections of the area between the active fire and the containment lines. Implementation of this option would require very specific conditions including wind direction, wind speed, smoke dispersion forecasts, temperature, and humidity. The Table Rock wildfire, which started November 12th, is located in the Linville Gorge on the Grandfather Ranger District, Pisgah National Forest. Size of the fire did not change today, covering 2,275 acres and 40 percent containment. There are 200 firefighters working on the fire. Todays activities were directed toward construction of contingency lines and mop up of “hot spots” or sites of significant heat near the fireline. An infrared camera was used to identify areas of heat along containment lines. Most of the heat was interior, but some was located near the south flank where the spot over occurred. Crews hiked into that area today to assess options for containment. A helicopter made water drops on hot spots in order to reduce the potential for spread. Firefighters are making progress on containment lines for the Table Rock wildfire in the Linville Gorge. Recent rains have slowed progression of the fire, but concerns still exist over a section of uncontained line along the southern fire flank. Crews continue to improve contingency lines along Forest Road 118 and the US Forest Service property line. There is still a large area of unburned fuels between the active fire and those lines. A concern is that fuels in those areas could re-ignite uncontained portions of the current fireline perimeter. The strategy today is to monitor fire progression and ensure resources are in place if the fire moves south. Infrared aerial photos will be taken this morning to look for hot spots along the firelines. Patrols did notice an increase in heat yesterday as the winds picked up and fuels began to dry out. Work will continue on structure protection within the Outward Bound Camp. Crews working with the Camp will reduce fuels around buildings and eliminate fire hazards. North Carolina Forest Service personnel are assisting with land owner contacts and providing advice on how to improve defensible space. Fire size remains the same this morning, with 2,275 acres burned to date and 40 percent containment. No additional structures are threatened and no additional injuries or accidents to report. There are 193 personnel working on the fire and the Type 3 Incident Management Team will transition with the Type 2 Team throughout the day. For information on the latest road and trail closures, visit the National Forests in North Carolina website. Visitors should check the website before planning a trip to the gorge. Additional information and photos can also be found at the Incident Information System website http://inciweb.nwcg.gov/. Firefighters spent the better part of the day constructing containment lines around the Table Rock fire, in the Linville Gorge. The fire that began on Tuesday, November 12th, in the Table Rock Picnic Area is still proving difficult to fully contain. Close to a half inch of rain fell in the gorge over the weekend, but that was not enough to ease the minds of the North Carolina Type 3 Team who is tasked with suppressing the fire. There were isolated smokes in the gorge today, but just because there is no smoke does not mean there is no heat. The team expects there to be a steady increase in smoke over the next couple of days as the fuels start to dry out as a result of warmer weather. That could lead to the potential for embers to ignite unburned areas and allow the fire to burn across the drainage. Fire crews focused on mop up and patrol around the Outward Bound camp, and worked with the property owners to improve their defensible space around individual structures. A dozer line was constructed around the facility last week, and the area was burned out as part of the mitigation measures. These additional measures will enhance the safety of the residents when they return. There was no increase in fire acres today and the total still stands at 2,275 acres with 40 percent containment. No additional structures are threatened and no additional injuries or accidents to report. There are 193 personnel working on the fire and the transition to the Type 2 Incident Command Team begins tomorrow. For information on the latest road and trail closures, visit the National Forests in North Carolina website. Visitors should check the website before planning a trip to the gorge. The cause of the fire is still under investigation. However, fire investigators would appreciate talking with the group who were camping at Table Rock Picnic Area last Monday, Veteran’s Day. Investigators believe this group has information that would aid in the investigation. A reward may be offered for substantial information regarding this investigation and persons should contact Law Enforcement Officer Jason Crisp at 828-442-2470 or the Grandfather Ranger District at 828-652-2144. 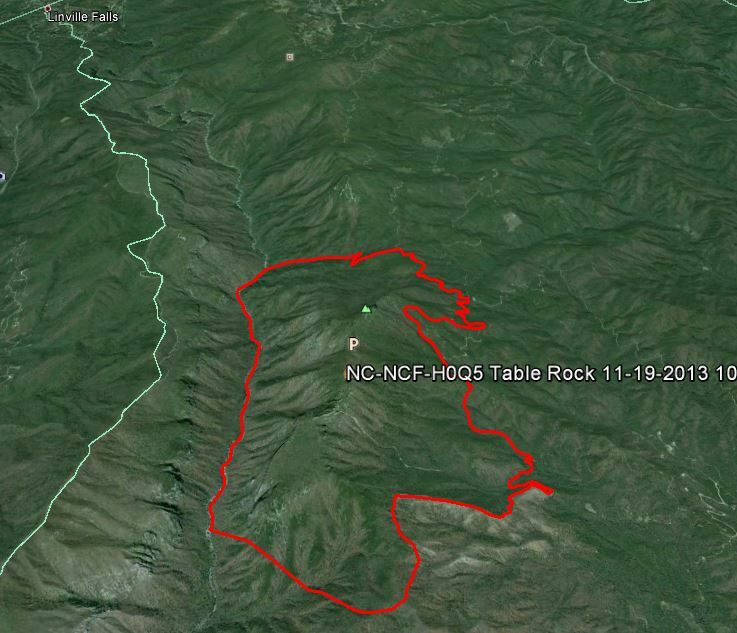 Map of the Table Rock Fire from the Forest Service on Monday. Click in upper right corner to open in a new window. The Linville Gorge area received about a half inch of rain yesterday, which included the area of the Table Rock wildfire. The fire that started about a week ago is still burning in the gorge on the Grandfather Ranger District, Pisgah National Forest. The fire started in the Table Rock Picnic Area and quickly moved south and east into surrounding terrain. The rain received yesterday was much needed as the area has seen dry conditions for the past few months. However, this fire is not out and the warm, drying period over the next week could be a real test on new containment lines. Winds are expected to gust to 20 miles per hour today and fuels will quickly dry out under these conditions. The fire is located in a very remote area of the gorge that is extremely steep and rugged. 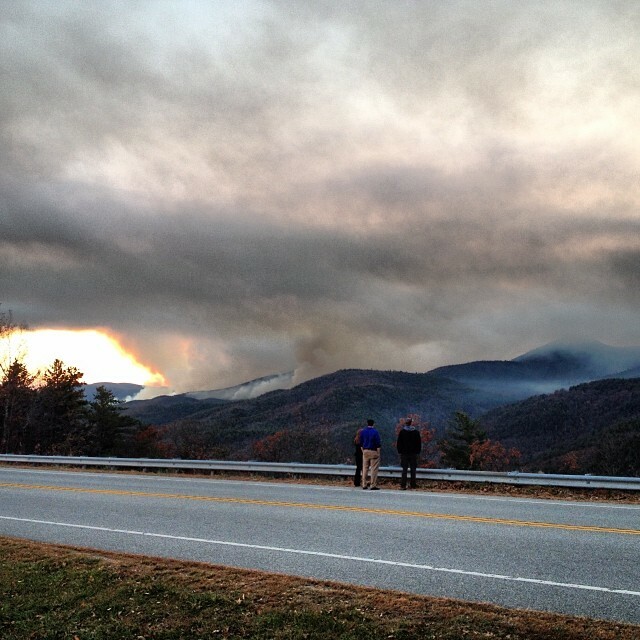 There are 193 fire personnel assisting with suppression efforts in the Linville Gorge. A 20 person hand crew from the Oklahoma Bureau of Indian Affairs joined the fire fighting forces today. The fire is still listed at 2,275 acres and 40 percent containment. One structure is located within the containment lines and may be threatened if the fire were to make a run to the south. Crews remain staged to the north at the Outward Bound camp to provide structure protection. Structure protection measures have been applied by fire crews assisted by the property owner. Only one minor vehicle accident which occurred within the first couple of days was reported. The focus of today’s work is to construct containment lines and remove safety hazards, such as snags, within those lines that could compromise firefighter safety. Crews along the north end will patrol existing containment lines and mop up any “hot spots” they find near the lines. The large Type 1 helicopter that was reassigned over the weekend, but is available if bucket drops are needed for suppression. Smaller Type 2 and Type 3 helicopters remain on site for immediate response needs. The contingency plan for fire containment includes using Forest Service Road 118, old dozer lines along the Forest boundary to the south, and hand lines using trails near the river. The North Carolina Type 3 Team assessed complexity of the fire over the weekend. Concerns regarding the steep terrain, lack of access, an increase in firefighters, multiple jurisdictions with the state becoming more involved, and predicted weather patterns for this week changed the complexity of the fire to a Type 2 incident. This complexity results in a change in command structure on the fire. The Southern Area Type 2 Team was ordered today and will transition with the Type 3 team tomorrow, and take command of the fire on Wednesday. This new team will bring with them additional resources to help in suppression efforts. Several roads and trails remain closed in the Linville Gorge area. A complete list can be found on the National Forests in North Carolina website. Visitors should check the website before planning a trip to the gorge. 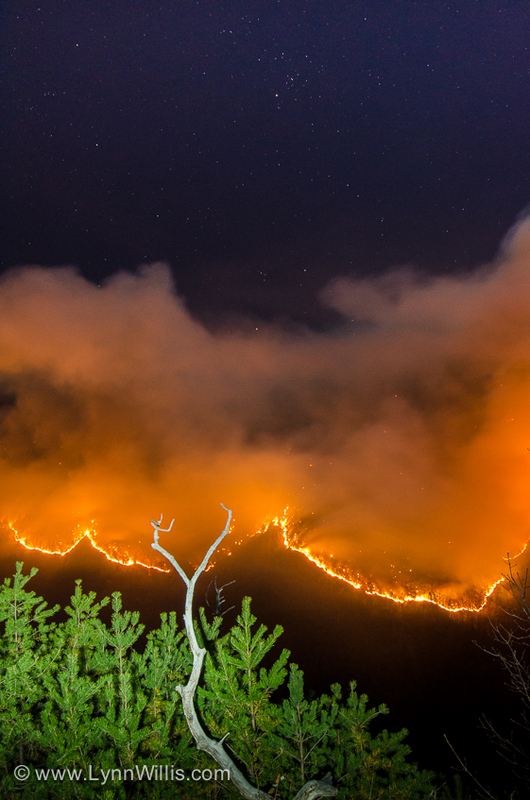 Forest Service officials are worried about high winds today across the Linville Gorge, on the Grandfather Ranger District, affecting their ability to continue suppression efforts on the Table Rock wildfire. Officials do not anticipate that winds will push the fire beyond the new containment lines, but this event highlights their concerns that this fire is not out even with the rain over the weekend and expected rain in the forecast. A storm front is expected to cross the area late today bringing some rain. The biggest concern is the wind, as it can bring down snags in the burn area. Firefighter safety is a concern with the Team, so crews have been pulled back until the front has passed and the wind danger has subsided. Crews and equipment will resume work on securing containment lines and cutting hazard trees once it is safe to do so. Close to 140 fire fighters are working on containing the Table Rock fire that began late Monday or early Tuesday last week. The size of the fire is estimated at 2,275 acres and containment at 40 percent. One structure is threatened within the fire perimeter, on private land. Crews are working with the landowner on defensible space measures to protect those structures. One minor motor vehicle accident did occur on the incident. 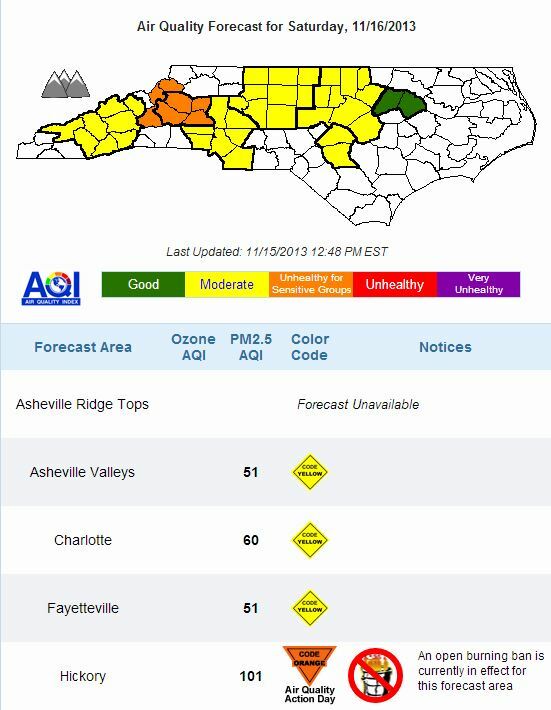 Several roads and trails are closed in the Linville Gorge area. A complete list can be found on the National Forests in North Carolina website. Visitors should check the website before planning a trip to the gorge. The 40 acre spot fire located yesterday south of the Chimney Gap area will continue to be a priority. Even though the fire did receive light precipitation it is not enough to extinguish the fire. Suppression efforts are still required. Due to the rugged inaccessibility of this area the possibility of continued spread is high. This will be the focus of the firefighting efforts for the next few days. The firefighting strategy for this area will be using helicopter bucket drops and indirect attack. Crews will begin line preparation efforts during the day, which includes mechanical line construction and removal of safety hazards such as snags. One structure has been identified on a parcel of private land within the new containment area. The team will be working with State and local cooperators to ensure adequate alert and protection measures are in place. The northern and western divisions are holding firm. Crews will continue to monitor and mop up these areas. A cold front is expected to push through the area Sunday night into early Monday in the area of the Table Rock wildfire in the Linville Gorge on the Grandfather Ranger District. Areas of fog in the morning mixed with smoke from the fire will result in visibility one quarter mile or less at times in the morning. Showers are likely with a chance of drizzle in the morning and then heavier showers are likely in the afternoon. The Incident Commander advises that the public should adjust their driving speed and following distances accordingly, especially on Hwy 181 between the intersection of Fish Hatchery Rd north to the Jonas Ridge area due to low visibility and high fire vehicle activity. The size of the fire is estimated at 2,275 acres with 40% containment. The reduction in the acreage figure is the result of more accurate mapping during the last reporting period. Additional resources have been brought in to aid in the firefighting effort bringing the total number of firefighters to 140 personnel, with resources coming from 10 states across the country. In response to concerns for public safety, several of the roads and trails in the Linville Gorge remain closed. If you have recreational plans in the gorge for next week you should first check the National Forests in North Carolina website for the latest closure information. 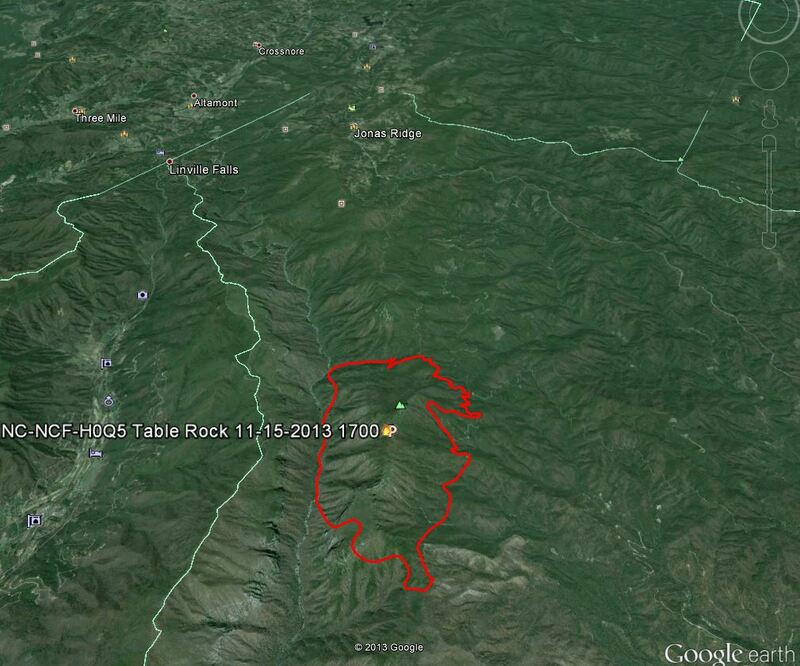 Map of the Table Rock Fire from the Forest Service on Friday. Click in upper right corner to open in a new window. Due to concerns over fire fighter safety, The North Carolina Type 3 Team is evaluating options for controlling the Table Rock wildfire in the Linville Gorge on the Grandfather Ranger District. “Even though recent rains have assisted fire fighters in their suppression efforts, this wildfire is definitely not out” stated Deputy Incident Commander Steve Little. Firefighting crews will continue to work on a spot fire that was discovered yesterday in the early morning hours. 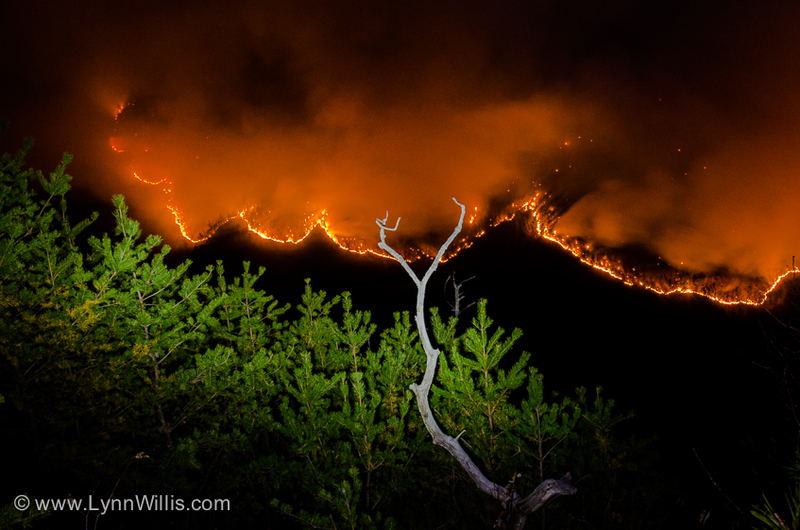 The wildfire breached containment lines in the Chimney Gap area. The spot over had burned more than 40 acres before it was discovered during the morning reconnaissance flight. The Team has identified several contingencies and different management objectives to implement the suppression strategy they had identified earlier in the week. No homes or structures are threatened by this new development, but the Team will be working with State and local cooperators to ensure adequate alert and protection measures are in place. Suppression tactics today will focus on securing containment lines along the southern and eastern perimeters. Crews will begin line preparation efforts during the day, which includes mechanical line construction and removal of safety hazards such as snags. Various options have been identified in case the fire moves beyond expected containment lines. Lines on the north side are holding firm along Spence Ridge and around the Outward Bound camp. Crews and an engine are applying structure protection measures around the camp and will stay in place as long as necessary. Size of the fire is estimated at 2,700 acres with 40% containment. There is one structure on private property identified within the containment lines. Protection measures are being implemented to reduce the risk of damage from the fire. There was one reported injury from a minor vehicle accident. Additional dozers and another 20 person hand crew were ordered today to assist with suppression efforts. This brings the total number of firefighters to 140, representing 10 states across the country. Two additional trails were closed yesterday in the Linville Gorge area, the Hawksbill Trail (#248) and the Pinnacle Trail (#440). In response to concerns for public safety, several of the roads and trails in the Linville Gorge will remain closed. If you have plans to recreate in the gorge this weekend you should first check the National Forests in North Carolina website for the latest closure information. 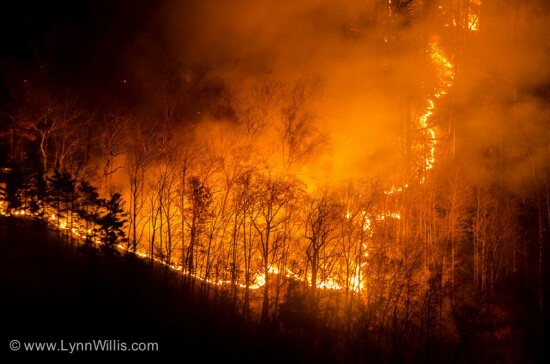 The Table Rock wildfire advanced south today, moving across containment lines at Chimney Gap. Line construction in this area was difficult due to steep, rocky terrain and inaccessible areas in the rock outcrops. A 40 acre spot fire was found during the morning reconnaissance, causing the North Carolina Type 3 Team to implement contingency plans which identified new containment lines. There are no structures threatened as a result of this new development, and the Team plans to bring in additional fire fighters to help in suppression efforts. Two helicopters dropped water on the spot fire most of the day and an additional helicopter (Type 1) was ordered, which can drop up to 1,000 gallons at one time. Most of the suppression activities today were focused around burn out operations along the south flank. Dozer lines held on the eastern side of the fire, tying in with Forest Road 118. Agency crews and the Oak Hill Volunteer Fire Department continue to stand by at the Outward Bound camp, in case the fire pushed on the northeast containment line. Fire is still backing in the southwest corner but all other areas have fully burned and fire activity is mostly out. Weather conditions worked in the crews favor with higher humidity and light winds. Most of the smoke is drifting to the east, impacting mostly forest lands. Communities near the fire will continue to experience some smoke but not to a level which is considered dangerous. Smoke dispersion is expected to be poor this evening, and residents east and south of the fire may experience an increase in smoke into tomorrow morning. Size of the fire is estimated at 2,700 acres with 40% containment. There are no additional structures threatened and no reported injuries. 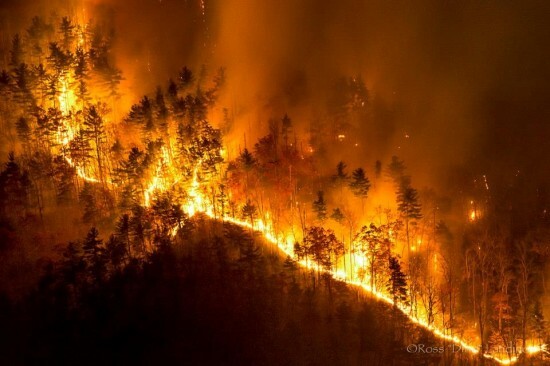 Just over 100 fire fighters are assisting with the suppression efforts, representing North Carolina, South Carolina, Georgia, Tennessee, and Kentucky. Roads and trails in the Linville Gorge remain closed to the public. If you have plans to access the gorge this weekend you should check the National Forests in North Carolina website for the latest closure information before leaving on your trip. The cause of the fire is under investigation. However, fire investigators would appreciate talking with the group who were camping at Table Rock Picnic Area last Monday, Veteran’s Day. Investigators believe this group has information that would aid in the investigation. A reward may be offered for substantial information regarding this investigation and persons should contact Law Enforcement Officer Jason Crisp at 828-442-2470 or the Grandfather Ranger District at 828-652-2144. 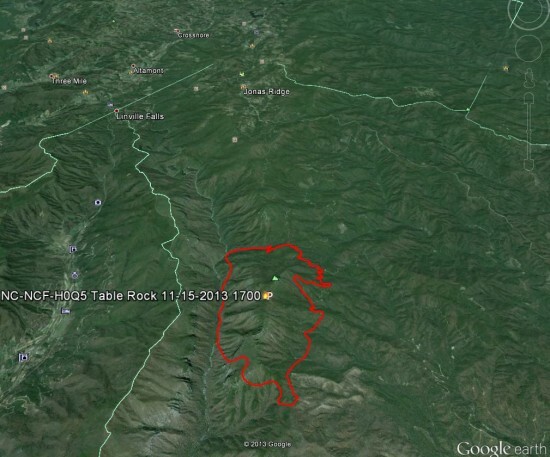 Map of the Table Rock Fire from the Forest Service on Thursday. Click in upper right corner to open in a new window. 3:50pm – North Carolina Air Quality Forecast for Saturday. Watauga and Avery have been downgraded due to heavy smoke pushing in from the fire. 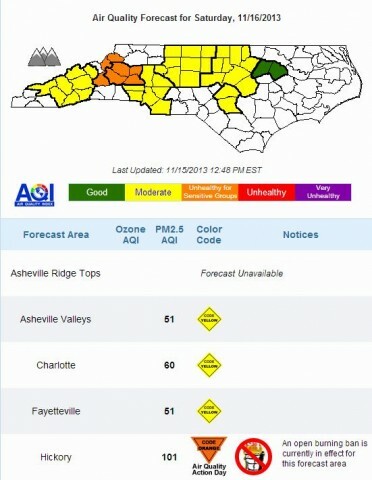 Graphic from N.C. Dept. of Environment and Natural Resources. For more information read their forecast discussion. 1:18pm – Smoke blowing into the High Country from the fire is thicker/heavier this afternoon than yesterday. Smoke is possible from the fire all weekend according to reports. 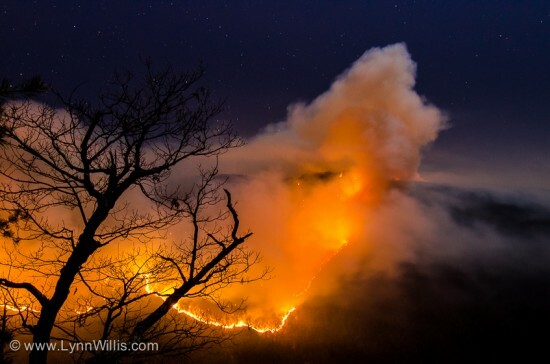 Fire fighters are making progress on suppressing the Table Rock wildfire in the Linville Gorge on the Grandfather Ranger District, Pisgah National Forest. A change in weather conditions today should bring some much needed rain to the area. 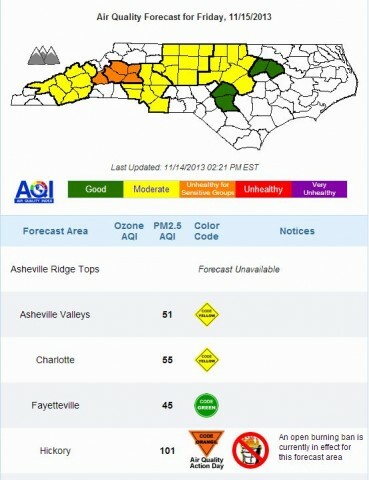 However, the rain is expected to be sparse across the Linville Gorge and will not be enough to fully suppress the fire. Total size of the fire grew to 1,800 acres yesterday with a 40% containment estimate as a result of extensive burnout operations. Wildfire suppression efforts today will focus on additional burnouts along the southern flank of the fire. Crews have built containment lines by hand and dozer, and expect to fire from these lines as they use fire to fight fire. Smoke will increase this afternoon due to the active fire and burnout operations. The public will continue to be affected by smoke in the immediate area but there should not be any serious impact beyond the Forest boundary. Federal fire fighters from 4 states have joined forces in North Carolina to suppress the Table Rock Fire, with more than 100 personnel working the fire. The Cherokee Hotshot crew from Tennessee is the most recent hand crew to join forces with the North Carolina Type 3 Team. To date, the fire intensity has been moderate across the gorge. Burnout crews are seeing full consumption of fuels as the set fires move toward the active fire, thus leaving few areas of unburned fuel between the fire and the containment lines. This means less potential for a re-burn later in the future. 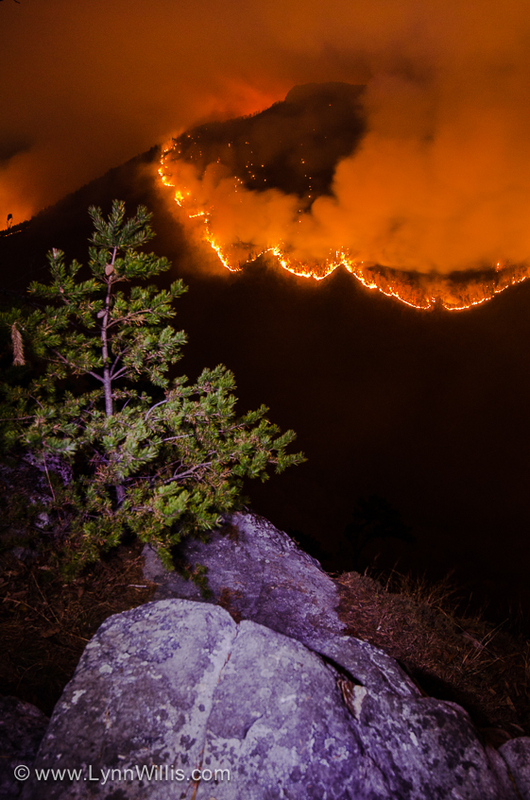 Twenty-five structures in the Outward Bound camp area were originally threatened by the wildfire, but containment lines and burnout tactics have been successfully used as protection measures. There are no additional structures threatened and no injuries to fire fighters to date. Roads and trails in the Linville Gorge remain closed to protect the public and fire fighters, who use the narrow, winding roads for fire access. 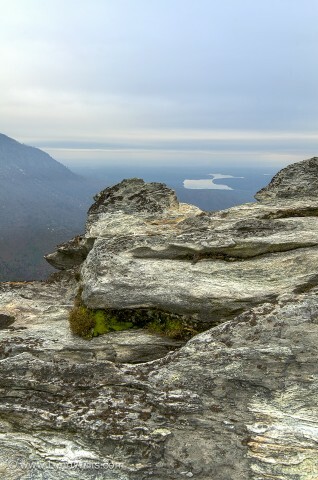 The public should check the National Forests in North Carolina website for the latest closure information before planning any trips into the Linville Gorge. The cause of the fire is under investigation. However, fire investigators would appreciate talking with the group who were camping at Table Rock Picnic Area last Monday, Veteran's Day. Investigators believe this group has information that would aid in the investigation. A reward may be offered for substantial information regarding this investigation and persons should contact Law Enforcement Officer Jason Crisp at 828-442-2470 or the Grandfather Ranger District at 828-652-2144. 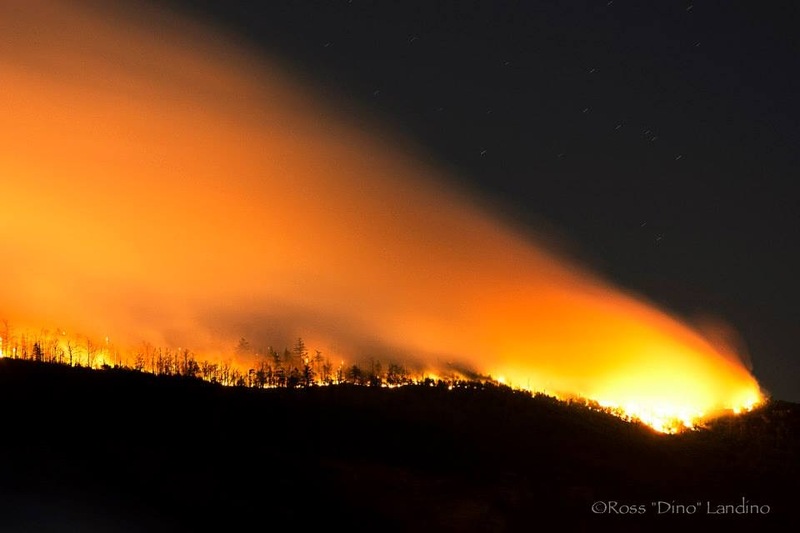 7am Nov 15 – officials are saying the fire is now 40% contained according to WCNC. No homes are threatened at this time. Firefighters made progress on the Table Rock wildfire today, as they concentrated their efforts on burn out tactics to reduce the spread of the active fire front. 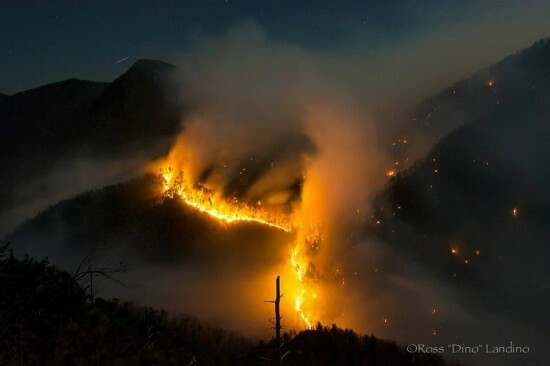 The Table Rock fire is located in the Linville Gorge on the Grandfather Ranger District, Pisgah National Forest, about half way down the gorge, south of Spence Ridge Trail. Size of the fire increased to 1,800 acres as a result of effective burn out operations conducted yesterday and today. Fire containment has not changed from the estimated 5 percent earlier today. Additional trails were closed today in the Linville Gorge. This includes the Conley Cove Trail (#229), the Pinch In Trail (#228), the Rock Jock Trail (#247), and parts of the Linville Gorge Trail (#231). Other trails around Table Rock Mountain and Shortoff Mountain along with the Table Rock Picnic Area are still closed to public access. 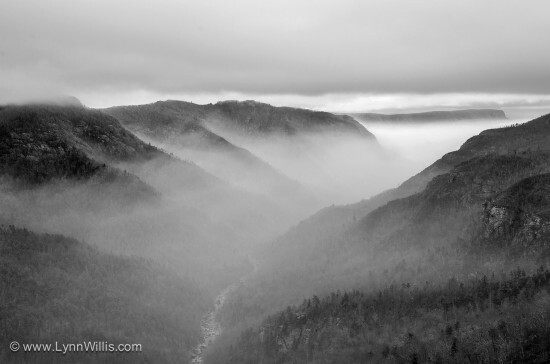 Visitors looking to access the Linville Gorge should check the National Forests in North Carolina website for the latest closure information. Several US Forest Service engines and the Oak Hill Volunteer Fire Department are standing by at the Outward Bound complex as protection resources in case the fire should cross containment lines surrounding the area. A total of 25 structures at Outward Bound were originally threatened by the fire. Dozer lines and burn out operations should provide additional protection measures for this facility. There are no other homes or structures threatened at this time. Close to 100 firefighting personnel are assisting with suppression efforts. Federal crews from several surrounding states are providing support to this incident. Most of the operations tonight and tomorrow will be centered around burn outs between the containment lines and the active fire front. Burn out tactics will be used to reduce unburned fuels between the containment lines and the wildfire itself. Crews will burn from the line with the expectation that the set fire will carry to the active wildfire areas. These burned out areas will reduce the spread by removing fuels that can carry a fire. The public will continue to experience smoke from the fire through the weekend. Winds from the south will push the smoke to northern communities during the day and will settle into the canyons at night. The cause of the fire is under investigation. Fire investigators are asking the public to contact the Grandfather Ranger District at 828-652-2144 with any information about persons in the Table Rock picnic area on Monday, Veteran's Day. 5pm – Lots of smoke in Watauga and Avery as winds have shifted pushing the smoke from the fire into the High Country. Fire crews made considerable progress on line construction for the Table Rock fire yesterday, even though fire activity did increase. 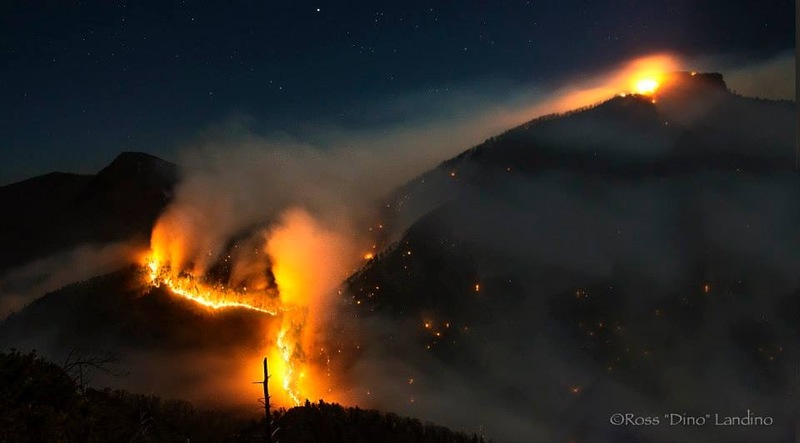 The fire is located in the Linville Gorge on the Grandfather Ranger District, Pisgah National Forest, within the perimeter of the Table Rock and Chimney area. This fire was first detected on Tuesday, November 12th in the Table Rock Picnic Area. Size of the wildfire increased to 300 acres yesterday as a result of westerly winds that pushed the fire to the east. Fire containment is estimated at 5 percent. US Forest Service engine crews and the Oak Hill Volunteer Fire Department were able to reduce fuels around the Outward Bound facility, by removing vegetation and burning out around the structures. There are no other homes or structures threatened at this time. Fire fighter numbers increased to 100 personnel overnight, as crews came in from surrounding states. No injuries have been reported. Additional resources will continue to arrive today as the NC Type 3 Team initiates operational tactics to slow the spread of the fire. Those tactics involve the use of fire to fight fire. A “burn out” operation will be used to expand the effectiveness of the containment lines. Crews will burn from the line with expectation that the set fire will carry to the active wildfire areas. These burned out areas will reduce the spread by removing fuels that can carry a fire. Today the public should see an increase in the amount of smoke coming from the area. The majority of the smoke is from the wildfire itself; however, some of the smoke will be a result of the burn out operations. The amount of smoke will be heaviest in the mid-afternoon and should dissipate by evening. Most of the smoke is expected to move northeast of Table Rock, although some smoke will settle into Linville Gorge tonight as winds decrease and humidity increases. Several trails in the Table Rock Mountain and Shortoff Mountain area are closed to public access. The Table Rock Picnic Area is also closed. 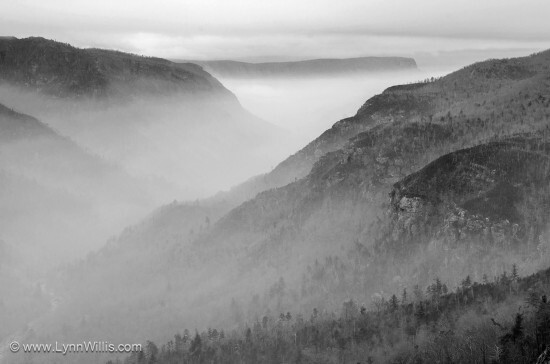 Visitors looking to access the Linville Gorge should check the National Forests in North Carolina website for the latest closure information. 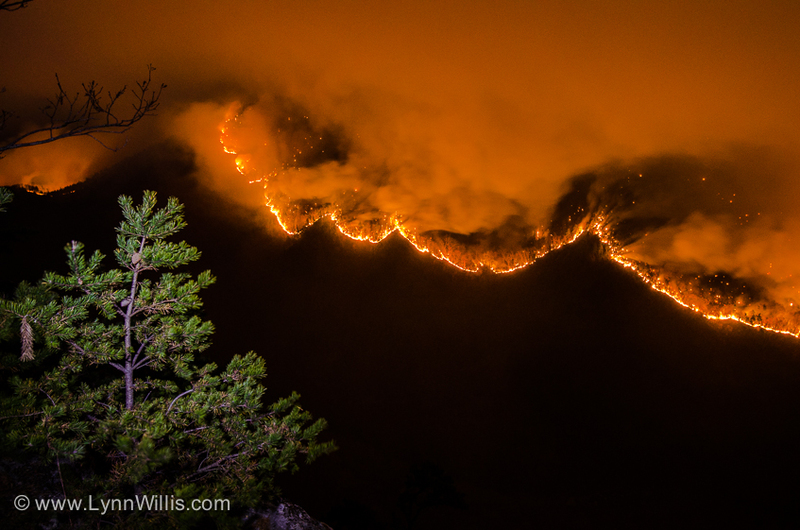 The Table Rock wildfire continues to burn in the Linville Gorge Wilderness area of the Grandfather Ranger District, Pisgah National Forest. Forest Service crews are working to complete containment lines to the north, south and east. Containment lines will be strengthened by conducting a “burn out” over the next couple of days in an effort to stop fire progression. Size of the fire is still estimated at 100 acres. 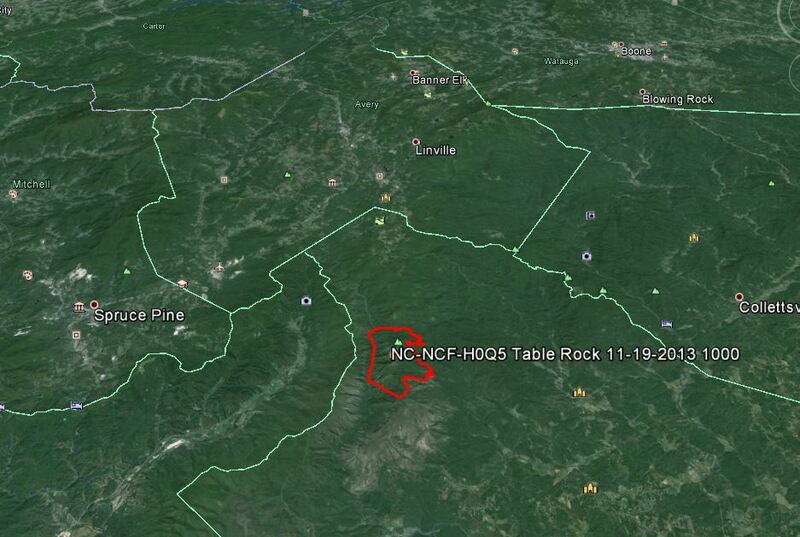 The fire is located in the Table Rock Mountain area, within the Linville Gorge, just north of the Chimney's. Fire activity was moderate today with some growth to the east. Engine crews, assisted by the Oak Hill Volunteer Fire Department, have been stationed at the Outward Bound facility to provide structure protection, should the fire continue to advance in that direction. Outward Bound staff left the area today and no other homes or structures are threatened at this time. Over 40 fire fighters are working to contain the fire with additional crews expected to arrive tomorrow. There have been no injuries reported and no loss of structures. 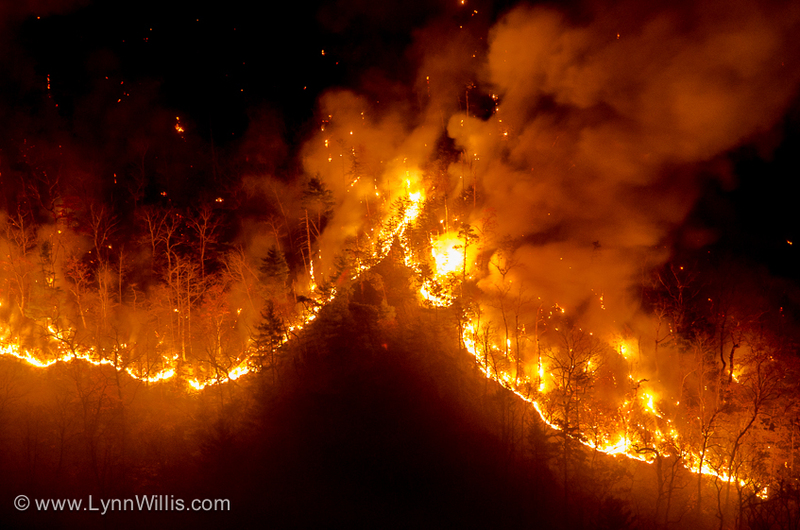 10am Update Nov 13 – Approximately 40 U.S. Forest Service firefighters and others are working to contain the wildfire in the Linville Gorge Wilderness area of the Grandfather Ranger District, Pisgah National Forest. 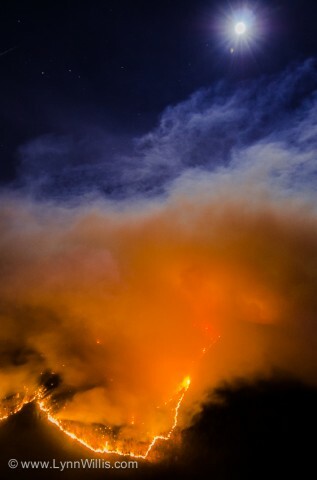 The wildfire grew from 40 acres to 100 acres overnight. The fire, known as the “Table Rock Fire,” is about one-quarter mile southwest of Table Rock Mountain in the east-central part of the Gorge. Firefighters are cleaning up existing roads, trails and existing firelines from previous fires to contain the wildfire. Zero percent of the fire is contained at this time. The fire burned actively through the night and is expected to grow in size over the next couple days. Firefighters continue to protect the Outward Bound base camp area, which is vacant. No other homes or structures are threatened at this time. No injuries are reported. Trails near Table Rock Mountain are closed as is the Table Rock picnic area. A Type 3 Incident Command Team will be in place by 6 p.m. today. The National Forests in North Carolina Forest Supervisor has approved the use of mechanized equipment, including leaf blowers and chainsaws, to suppress the wildfire in the wilderness area. The Forest Service will use bulldozers outside the wilderness area. Two helicopters will also be used on the wildfire. A Temporary Flight Restriction (TFR) should be in place over the fire today to protect the safety of aviation assets assigned to the fire. The cause of the fire is under investigation. Persons with information about individuals who may have been in this area last weekend are asked to call U.S. Forest Service Law Enforcement Officer Jason Crisp at 828-652-2144. 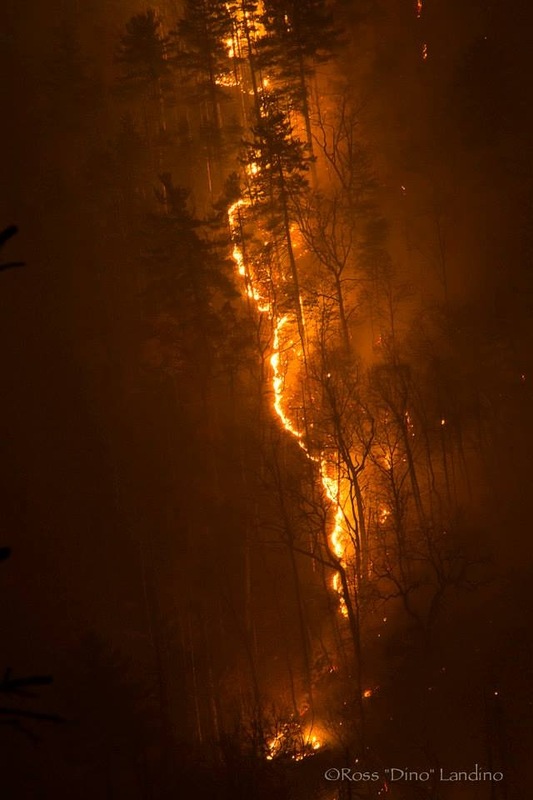 The U.S. Forest Service is working with the N.C. Forest Service, Burke County Emergency Management, and N.C. Wildlife Resources Commission to suppress the fire. A prescribed burn, scheduled to be conducted by the Forest Service in Burke County yesterday, was postponed due to the weather conditions. 3 pm Update: Approximately 20 U.S. Forest Service firefighters and others are working to contain a 40-acre wildfire in the Linville Gorge Wilderness area of the Grandfather Ranger District, Pisgah National Forest. The cause of the fire is under investigation. The fire, known as the “Tablerock Fire,” is about one-quarter mile southwest of Tablerock Mountain. The fire is located in the east-central part of the Gorge and is threatening the Outward Bound base camp area. The camp area is vacant. No other homes or structures are threatened at this time. No injuries are reported. Trails near Tablerock Mountain are closed as is the Tablerock picnic area. Currently, firefighters are creating fire lines to suppress the fire. A Type 3 Incident Command Team has been ordered to suppress the fire and will be in place by the end of tomorrow. This will bring the total number of Forest Service and other firefighters to close to 40. The National Forests in North Carolina Forest Supervisor has approved the use of mechanized equipment (such as leaf blowers and chainsaws) to suppress the wildfire in the wilderness area. The Forest Service will use bulldozers outside the wilderness area. Two helicopters will also help suppress the wildfire. A prescribed burn, scheduled to be conducted by the U.S. Forest Service in Burke County today, has been postponed due to the weather conditions. The controlled burn they had planned was cancelled. Officials believe it was set, possibly by accident. the rain tomorrow should finish it off right?